Concord Publications, ISBN 962-361-685-6. Price: unavailable. The saving grace of this book is the 179 B&W photographs, many of which are new to me. There are a few photos that show very unusual and unique items, as well as a fair amount of previously little-known photos of the “Desert Fox” himself, Erwin Rommel. Likewise, the color plates by noted artist Jean Restayan are nicely presented and cover a decent variety of tanks and other AFVs. More on all of that later; but first the bad news. To begin with, the introductory text is quite basic and certainly could have been more complete. For instance, there is no mention of the introduction of the Tiger Is of s.Pz.Abt. 501, or 504. 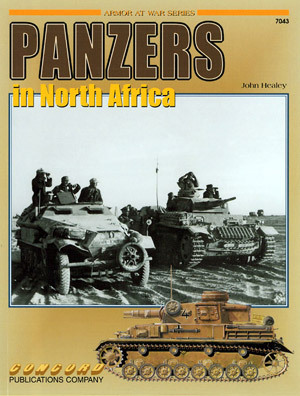 While several Italian divisions are mentioned as part of the Afrika Korps, only one armored division is mentioned; Ariete. What about Littorio and Centauro? The photo captions further reduce the author’s credibility, especially since nearly every tank or AFV is described as being painted “dark yellow”, a color that was not available on a wide scale until early 1943, and certainly was not in use in this theater in 1941 and 1942. Nearly every photo of the earlier Pz.Kpw. II is designated as “Ausf. A-C”, which is a pointless designation since these were all different versions of this early German tank. There are a number of bizarre captions, some of which left me scratching my head in amazement. For instance, on page 7, the photograph shows a Pz.Kpw. I with a white cross on a water-bearing jerry can, on the front of the tank. The author calls this an aerial recognition flag. Every photo of the ubiquitous British Universal Carrier is mislabeled as a Bren Gun Carrier, which was a distinctly different vehicle. Page 22 depicts a truck pulling what might be a bakery trailer, not an AFV pulling an ammo trailer. Page 25 has photos that I do not believe were taken in North Africa, judging by the terrain and uniforms the men in the photos are wearing. There are a few others like this, but I think the real problem is that the captions in general simply do not inform the reader. On the other hand, some of the photos are really quite unique. Page 12 depicts a watering point in the wastes of the desert, a perfect inspiration for diorama modelers. Page 22 has a new photo of the rare Pz.Kpw. II with 15cm SIG. The photo on page 28 depicts an Sd.Kfz. 251 Ausf. C with a riveted hull. What is intriguing here is that the edges of the upper and lower side armor plates appear to come together as a curve, not a sharp overhanging point. I’d love to know more about this one folks! Page 53 shows a towed, ex-Soviet 7.62mm gun in profile, at the moment of firing, exhibiting quite a muzzle blast. Another interesting photo on page 62 depicts a captured ex-British Universal carrier with a French 25mm Hotchkiss anti-tank gun mounted low in the front. Festooned with German crosses, this one would make a neat project, by combining the Heller kit of the gun with the Tamiya kit of the carrier. There are also a number of new photos of Pz.Kpw. IIs, IIIs and IVs, many of which are one-half page each, which allows for very easy viewing of details. The color plates are competently done by the well-known Mr. Restayan. They cover three different Pz.Kpw. IIIs and three Pz.Kpw. IVs, one each Pz.Kpw. I Ausf. A, Pz.Jgr I Ausf. B, Bef.Pz. I Ausf.B and Pz.Kpw. II Ausf. C. Other types such as a Tiger I, Marder III, Sd.Kfz. 251/1 Ausf. B, Sd.Kfz. 250/1, Sd.Kfz. 231, and Sd.Kfz. 263 round out the collection. The plates are nicely presented, but again, any time the color resembles a variation of “sand”, the captions state they are “dark yellow”. Recent research and published material from respected sources contradict almost everything this book says about colors. The information regarding colors has been readily available for a few years, so I am not inclined to be forgiving on this point. In the final analysis, this book is worth acquiring because of the amount and quality of many of the new photos. The rarity of some of the depicted items also favors this book belonging in the library of the modeler. Just beware of those captions. Concord Publications are available from retail and mail order shops, or from the publisher at: www.concord-publications.com.